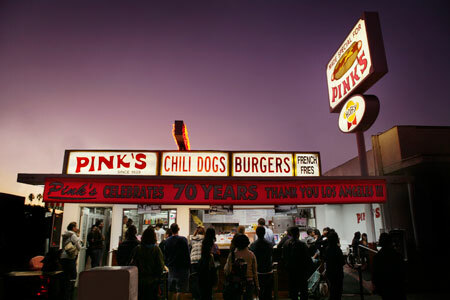 Pink’s is probably the most famous hot dog stand in the country… certainly in Los Angeles! Located near the corner of Melrose and La Brea, Pink’s can be found by looking for a crowd of people and following the aroma of fresh meaty chili and soft hot dog buns. It is unlike any other hot dog stand in America. For example, it has its own parking lot attendant (parking is free), and has been in the same location for 72 years. It is not unusual to see a Rolls Royce pull up to Pink’s (the chili dog ordered will be for the occupant, not the chauffeur!). Movie stars, well-known dignitaries, struggling musicians, and not-so-struggling businessmen, join with housewives, school children, and pet monkeys to savor the fabulously tasty Chili Dogs. Paul Pink started his hot dog stand in 1939. It was only a large-wheeled pushcart in those days. The depression was on and money was scarce. Pink’s chili dogs, complete with a large warm bun, over-sized hot dog, mustard, onions and thick chili sold for 10 cents each. His hot dog wagon was located in “the country”, rolling hills of weeds and open spaces. That was the corner of La Brea and Melrose seventy-one years ago! Times have changed, but not Pink’s. Oh, in 1946 Paul Pink did trade his hot dog wagon in for a small building (constructed on the vary same spot where the wagon had stood). But the stand hasn’t changed since those days. Today, Pink’s chili dogs sell for $3.30 each (with inflation and the shrinking dollar, they are a better bargain now than in 1939!). Pink’s still gives that very same quality now as then… mouth-watering chili, generously topping an all-beef hot dog with mustard and onions. Quality and service (an average Pink’s chili dog can be ordered, prepared and delivered to the customer in less than 30 seconds!) have been the two reasons Pink’s has not only survived, but become famous.